Clinically proven to heal & protect for 24 hours.Advanced Ceramide Therapy. Research proves that dry skin typically occurs when skin's ceramide levels are depleted. 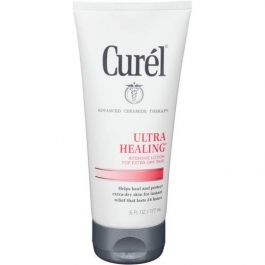 While traditional lotions only hydrate skin's surface, Curel® moisturizers work at the source of dryness to replenish skin's ceramide levels. - not just relieving symptoms, but actually improving skin performance. Extra-strength hydrating agents provide instant relief. Smooth onto dry skin daily. Reapply liberally to especially rough, chapped or ashy areas. For external use only.